One of the most wanted feature for the CashCrusader script is here! You can now automatically credit offers from affiliate networks' postbacks by using CashCrusader's Postback Catcher. The Postback Catcher collects data from the postbacks sent from your affiliate network and automatically credits users' accounts. It is now possible to install MyBB forum software parallel to your CashCrusader site and make CashCrusader synchronize user accounts to the MyBB user database table. This makes it possible for the users to get a forum account without separately registering to the forum. This means the CashCrusader username/password combination works to the forum. CashCrusader's rotating ads manager is now capable of targeting your rotating ads by the visitors' country. 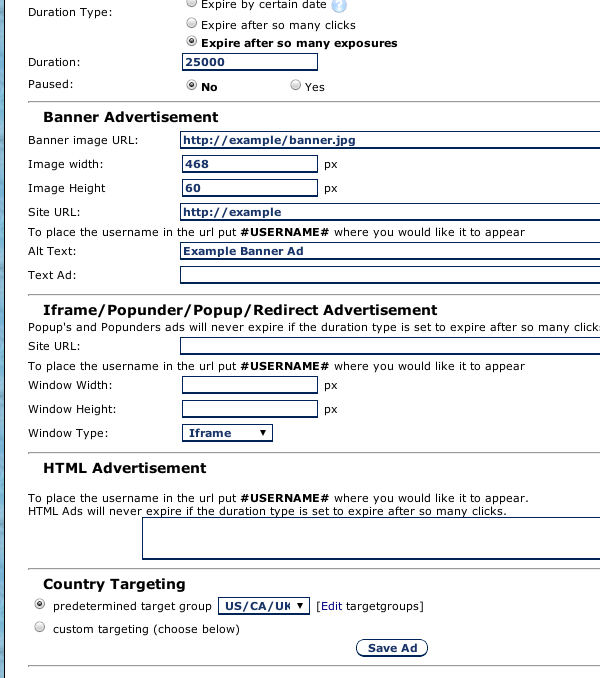 This makes it possible to have text links and banner ads targeted to countries of your choise. 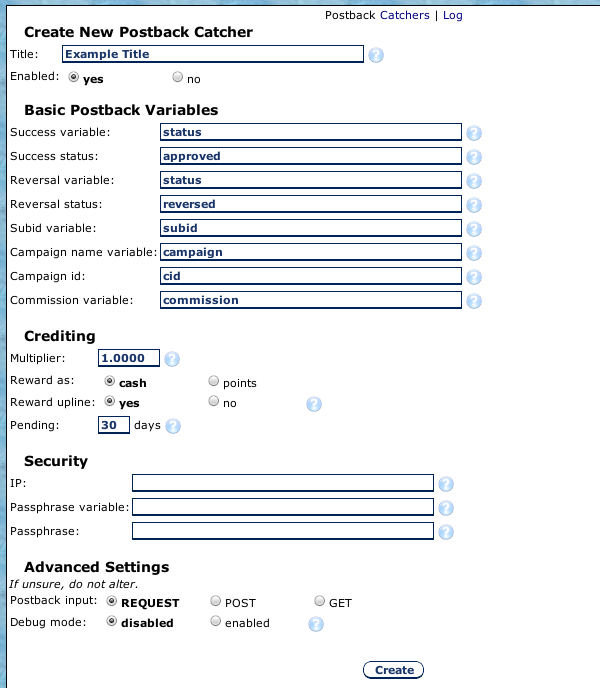 Also the rotating ads manager now supports pausing a campaign. It may sound like a little thing, but it surely makes your life easier when your admin panel session is not purged unexpectedly by the webserver when you haven't shown activity in some time. The admin panel has had a facelift. The most visible change is the new admin panel quick links panel. Also the help texts from often used admin panel pages have been put behind a link to make them on demand instead of always visible. Several files have been re-encoded with the latest ionCube encoder to make them compatible with the PHP 5.4 ionCube loader. Also deprecated PHP functions mysql_list_tables and mysql_tablename have been removed to make CashCrusader as forward compatible as possible. Turing number positioning has been fixed for the newer PHP versions (5.3.4+) as well. CashCrusader admin panel security has been improved and several minor MySQL injections have been patched. CashCrusader 3.0 has additional plugin hooks. Using the hooks, third party script developers can create even better plugin products for CashCrusader. New plugin hooks make it possible for third party scripts to integrate themselves to the admin panel's user profile viewer, reminders, user login event, user signup event, user purged event and know when user's profile is updated. 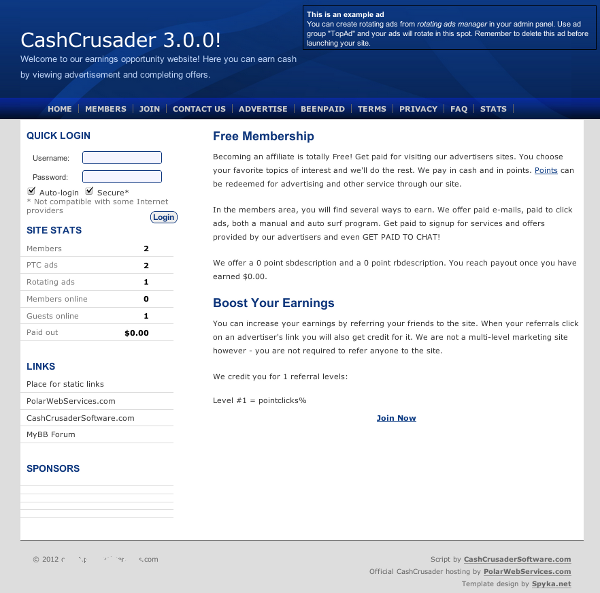 The default template has been completely replaced for CashCrusader with the release of 3.0.